Because of having to perform in my show (as promoted by BowieNet) I have spent the last week in London, enjoying the sights and smells of the city. This was generally an enjoyable and enlightening experience and I saw some lovely things. 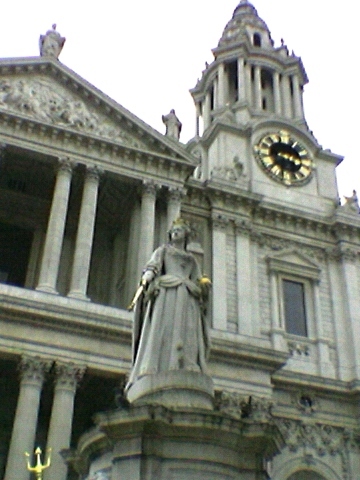 The nice clean front of St. Paul’s Cathedral has now been revealed and it is looking fabulous. Unfortunately the entry fee is something like Â£7, a ridiculous amount to pay to pop into a house of God, so I was forced to bluff my way in. Successfully, I should add – if you ever want to get in for free, just tell the stewards that you are there to see Canon Martin Warner and you’ll be waved through. 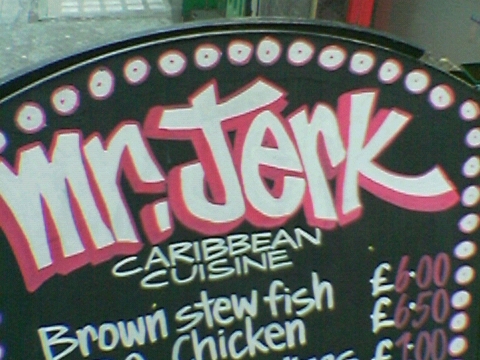 I’m not sure why the fact that top of Mr Jerk’s menu is “brown stew fish” makes seem even funnier, but it does. Methinks he must be a spy – because only a spy would have the technology to receive radio transmissions on the London underground. 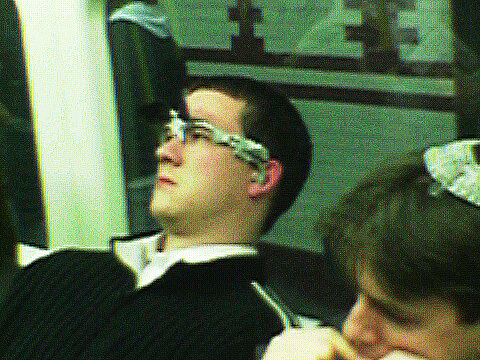 You’d have thought he might put some glass into the glasses frames, though, to draw attention away from his secret agent status. I also met up with some interesting and diverting people whilst in the capital. For the first time in a while I saw the UD’s very own Philip Stott and his very wonderful girlfriend Delyth Jones. 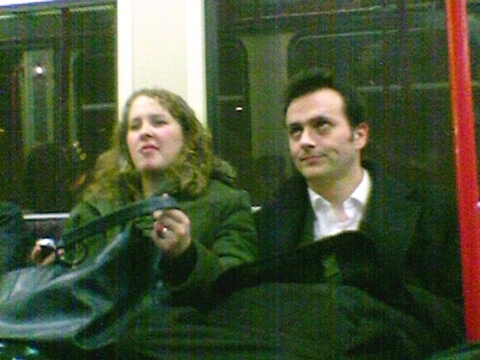 Here they are on the Docklands Light Railway shortly after seeing my show. Perhaps you can try to guess from their faces what they thought of it. 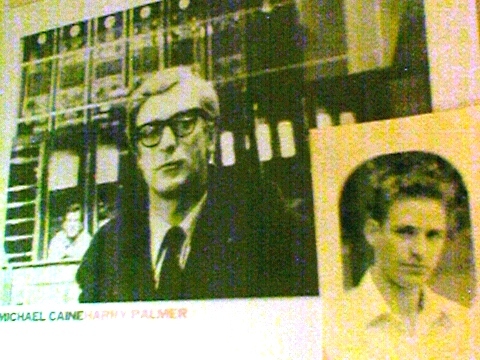 It is also worth pointing out that Phil has stuck my picture up on his wall. Much of my time was spent with my co-star, Fran Lebens. 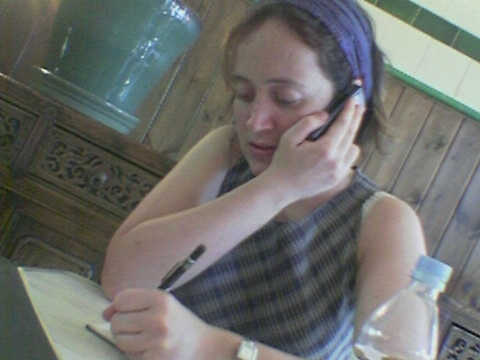 Here she is being my personal secretary. Who’d have thought that you could suddenly find yourself listening to such a gem in a tiny cafÃ© in Hampstead? And they way Archie read them made the words come to life in the most incredible way – a table of people held their breath and leaned forward to catch every nuance of his delivery. 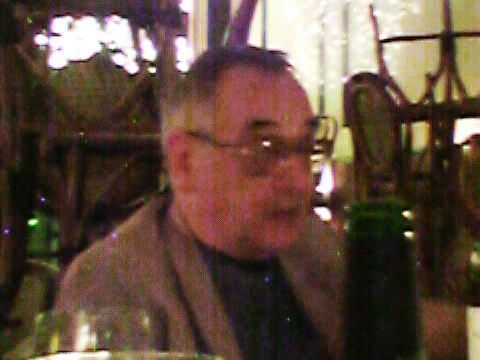 It was like listening to a Dylan Thomas reading his own poetry. Except the accent was different. And of course, people have heard of Dylan Thomas, whereas nobody has heard of Archie Colquhoun. Which I think is a crying shame – he certainly deserves to have his poetry known, and they probably ought to be preserved in an audio format if the world isn’t going to lose something rather special.